Vraisemblablement Votre Veloclub: The Land of the Ice and Snow! The Land of the Ice and Snow! 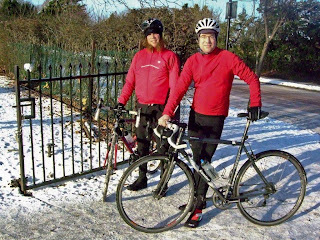 At 9 o'clock a.m. on Saturday, 7 January 2010 the unhungover members of the TroisV met at the official meeting point and rode five laps of Regent's Park Outer Circle before retiring to a sort-of-but-not-really French cafe in Marylebone for porridge, fruit and coffee. It was cold. It was windy. It was even, briefly, blizzardish. We praise our layers, our tights, our gloves, our overshoes, and of course, ourselves. TroisV! I did mention I saw Robert Plant later that day? You are better men, ah bikers, than I.